In a previous study, we optimized the acidic treatment of brown algae to facilitate the efficient sequential extraction of fucoidans and alginates, using a sample of the brown alga Ecklonia radiata. Here, we applied the optimized process to other brown algae feedstocks from South Australia, in order to assess their potential for valorization and to determine whether the process was effective when using different feedstocks. The starting materials included samples of Macrocystis pyrifera, Durvillaea potatorum, Seirococcus axillaris, and two more samples of E. radiata collected from different sites and at different periods. The initial feedstock sample (as used for optimization) was also included for comparison. In terms of product yields, the sequential process appeared to perform similarly for all feedstocks (30–40 % of total available fucoidans and 80–94 % of total available alginates), with the exception of Seirococcus axillaris (5.5 and 74 %, respectively). The remainder of the fucoidans either resisted extraction or were hydrolyzed by the acid treatment. The fucoidan extracts had sulfate contents of 10 to 30 % by weight and fucose contents of 12–30 % by weight and exhibited antioxidant potential, to which the presence of phlorotannins contributed. 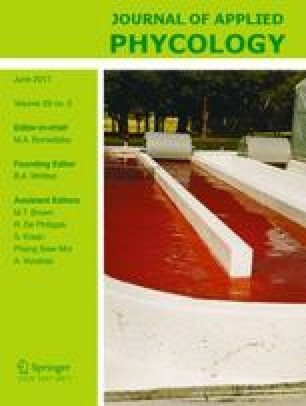 The quality of the alginates varied, with M. pyrifera yielding the most viscous (599 mPa s) and colorless alginates, while the alginates from S. axillaris had the lowest mannuronic to guluronic acid ratio (0.54), indicating the strongest gel-forming capability. The authors wish to thank Fred Gurgel at the State Herbarium of South Australia for identifying the algae species. We would also like to acknowledge the funding support from the Premier’s Research and Industry Fund of the South Australian Government, Qingdao Gather Great Ocean Seaweed Industry Co., Ltd., Australian Kelp Products Pty Ltd., and Flinders University. The support of the Australian Research Council (project ID LP150100225) and the Centre of Excellence in Plant Cell Walls is also gratefully acknowledged.